CHICAGO — Nissan intends to stir up the outdoorsy appeal of its midsize Pathfinder crossover through a Rock Creek Edition that adds $995 to the sticker of the model's SV and SL trim levels. The automaker introduced the variant last week at the Chicago Auto Show, saying it will be available in the spring on both two-wheel- and all-wheel-drive configurations. The upgrade features dark 18-inch wheels, black mesh grille, black roof rails, black door handles and outside rearview mirrors, black front and rear fascia accents and black molded overfenders. The interior includes two-tone seating surfaces and badging, high-contrast stitching on seats, door, console lid and steering wheel, and premium metallic interior trim. For an additional $980, a new SV Rock Creek Edition Technology Package includes the NissanConnect smartphone-based infotainment system, heated cloth front seats, heated steering wheel and heated outside rearview mirrors. A new SL Rock Creek Edition Premium Package, for $2,110, includes a Bose 13-speaker audio system and panoramic moonroof. The Pathfinder, with three rows of seats, competes directly with the Honda Pilot, Hyundai Santa Fe and other midsize crossovers, but also the slightly larger Toyota Highlander, Chevrolet Traverse and Ford Explorer. 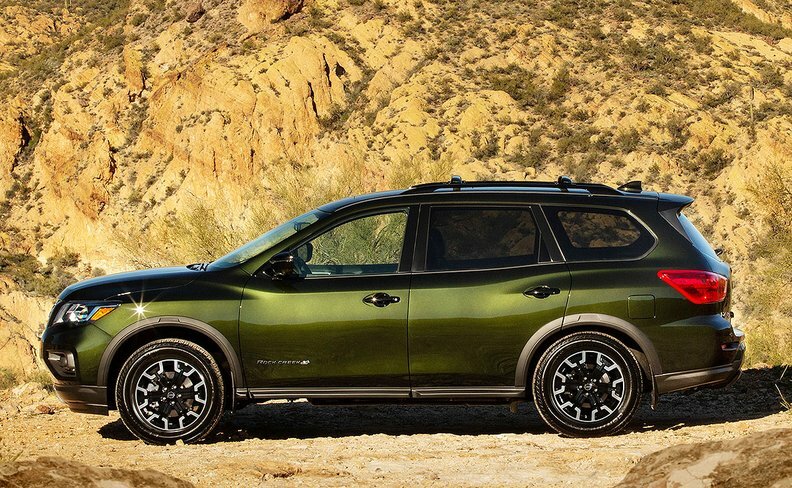 Pathfinder "has always exemplified this sort of connection to the outdoors, adventure, active lifestyle," Nissan North America Chief Marketing Manager Scott Shirley told Automotive News. "Rock Creek is a platform to accentuate that." Special editions help bring attention to models late in their life cycles. Offering a package such as the Rock Creek Edition allows Nissan to put together features at a lower cost rather than having them as standalone options, said Sam Fiorani, vice president at AutoForecast Solutions. "Tying the Pathfinder to an outfitter, such as Rock Creek, has the added benefit of appealing to the core buyer's desire to get back to nature," Fiorani said. While U.S. sales of the Pathfinder fell 17 percent to 67,550 last year, they still account for a significant portion of Nissan's volume and an even higher percentage of the automaker's profit. The Pathfinder received a major freshening in 2016, and a redesign is expected in 2020 or 2021.